"Life is fraughtless ... when you're thoughtless." Tomorrow marks an important date in American history -- one that will reverberate through posterity due to its massive impact on culture and society. No, I'm not talking about the 1993 assault on the Branch Davidian Compound in Waco, TX (which is eerily similar to the recent raid -- in Texas also -- of a polygamist compound [h/t tdaxp]). Nor am I talking about Timothy McVeigh's domestic terror attack on the Murrah Federal Building in Oklahoma City two years later. And no, I am not talking about "the shot heard 'round the world" at the Old North Bridge in Concord, Massachusetts in 1775 during the Battles of Lexington and Concord that kindled the American Revolutionary War (aka "Patriots' Day" by residents of the Commonwealth of Massachusetts and runners of the Boston Marathon). 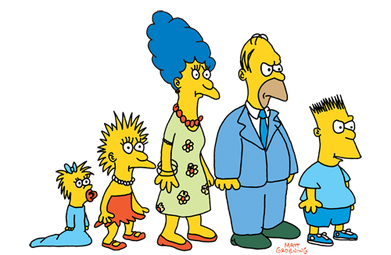 No, I am referring to the first airing of "The Simpsons" shorts on the Tracey Ullman Show on April 19th, 1987. In the words of the inestimable Bart (an anagram for "brat"), "Cowabunga!" The Traveler IQ challenge ranks geographic knowledge of cities such as: Clearwater, Denver or Hong Kong by comparing results against 6,406,195 other travelers.